This model town in the Riviera Nayarit offers visitors a riot of images; an ancient fishermen’s village, it boasts a strong community spirit and has managed to evolve without losing its essence. 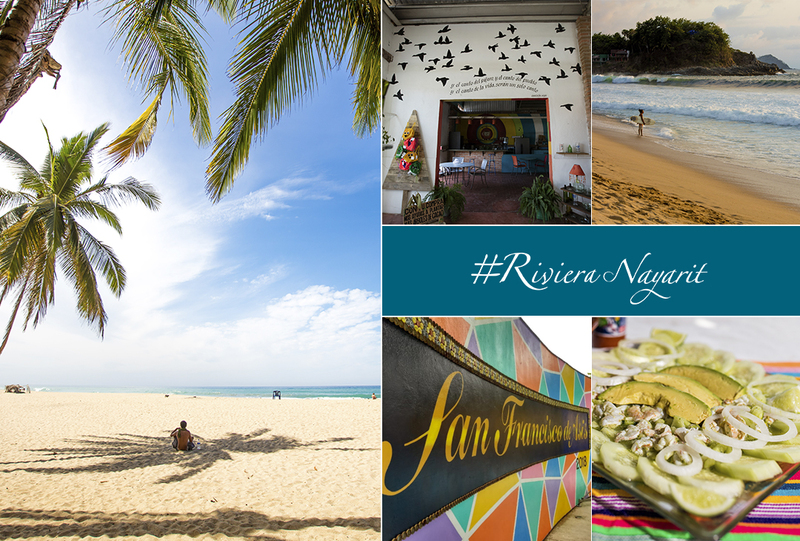 Its full name is San Francisco, but everyone lovingly calls it "San Pancho:” an ancient fishermen's village that stands out as much for its natural beauty as for its artistic offer, so much so that it's known as the Cultural Capital of the Riviera Nayarit. 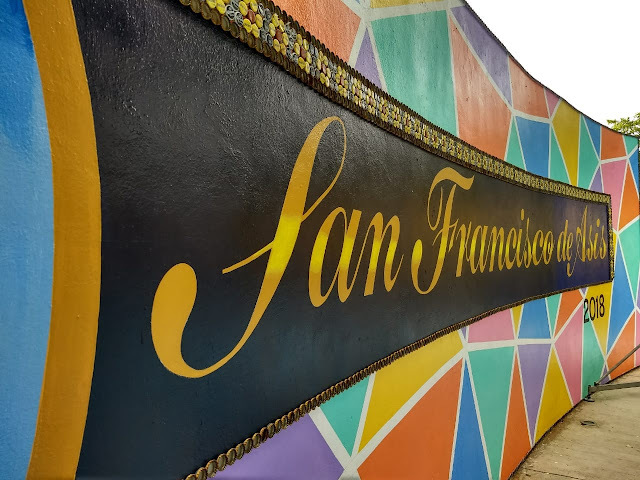 San Pancho is a magnet for tourists as well as domestic and international artists who, in many cases, have gone on to become residents of or frequent visitors to this quiet town with its cosmopolitan, artistic, and multicultural ambiance. There's no doubt this is the dream destination of many when they think of retiring to a peaceful place surrounded by natural beauty. San Pancho also boasts a strong community spirit, and it has learned to evolve without losing its essence. This welcoming town quickly entices the visitor to walk down the cobblestone streets that cross the main avenue named Tercer Mundo, or Third World. The whirlwind of images begins the moment travelers cross the bridge just past Federal Highway 200. The church across from the plaza, for example, has a rustic architecture and white walls, and was dedicated to Saint Francis (San Francisco.) San Pancho celebrates patron saint feasts in his honor from September 26th through October 4th. There’s another small plaza at the end of Tercer Mundo Avenue with a sculpture of the Patron Saint, providing a quiet retreat of ancient trees, palms, and gardens. 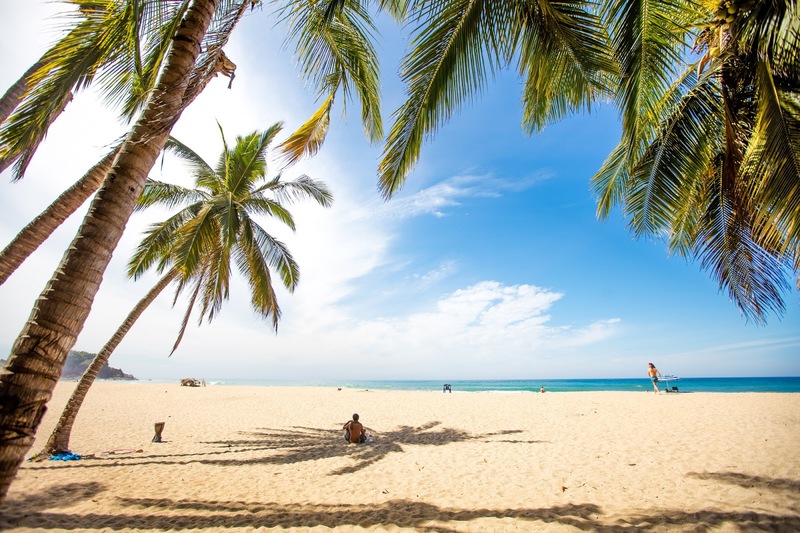 The beach is just a few streets away: it's a wide, clean beach frequented by bathers looking to chill out with a view of the water and other, more adventurous visitors who prefer to ride the Pacific waves on their surfboards. The new mural in the main plaza. Visitors to San Pancho will find everything from cultural centers, galleries, arts and crafts stands, hostels, bakeries, cafés, and small restaurants to soccer, golf, and polo fields, and luxurious beach residences. 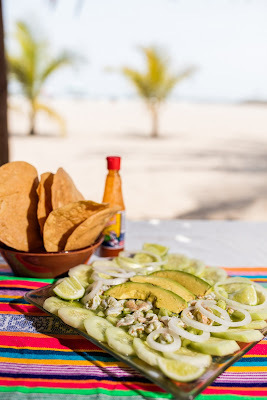 The rustic restaurants serving authentic cuisine from the coast of Nayarit stand right at the end of Tercer Mundo Avenue: ceviche, aguachile (raw shrimp marinated in lime juice), fish cooked over coal fires, and many other tasty plates. 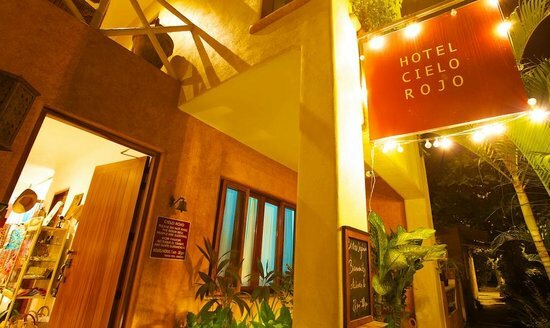 The Cielo Rojo restaurant and its Bistro restaurant are also in town, appealing to different palates: it's an organic establishment, meaning 80% of its products are from local farms, guaranteeing a quality product free of pesticides. The restaurant also promotes buying local, which generates added revenue for the local community. The first thing to catch the traveler’s eye is a rustic group of buildings lined up along the left side of Tercer Mundo Avenue. 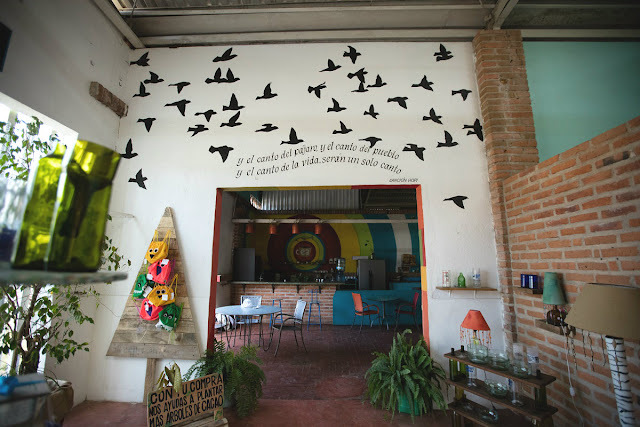 Known as Las Bodegas de San Pancho (San Pancho Warehouses), they are home to four cultural and ecological groups: Colectivo San Pancho in the Bodega 3; the Entre Amig@s educational Community Center; Alianza Jaguar; and the Bodega Circo (Circus Warehouse). These warehouses were built during the presidency of Luis Echeverría Álvarez. They stood unused for 20 years, but since 2006 they have served as a retreat for a group of young domestic and foreign artists who develop cultural products and projects. The warehouses have set the stage for the Sinergiarte Festival for the past 13 years. this cultural event came into being when the town’s artists joined together to share their work and promote art, culture, and traditions among the inhabitants of the community and their visitors. San Pancho has a lot to be proud of: it’s also home to the Children’s Circus, the only one of its kind in Mexico. The circus opens its doors yearly for a fundraising event: Every season, the Bodega Circo is transformed into an elaborate, fantastical stage to showcase the talent of local children and teens. The school was created in 2011 by Gilles Ste-Croix, co-founder of the Cirque du Soleil, and designed by Monique Voyer. What began as an introduction to the circus arts has become over the years something very precious for this town. The school has a professional team of instructors and a growing number of students looking to experience circus magic and other stage arts. EntreAmigos has also been recognized by the Secretariat of Environment and Natural Resources (Semarnat) as an Environmental and Educational Center (CECA) thanks to its commitment to raising awareness on environmental topics through culture and the arts. This community vision has been a critical factor in protecting San Pancho from the encroaching menace from real estate companies and the massive arrival of tourists during high season. La Patrona Polo & Equestrian Club, one of San Pancho's icons, has a top-notch, cutting-edge polo infrastructure—everything needed to be a part of the international circuit. The action centers around establishing new generations of new polo players, as well as supporting female polo. 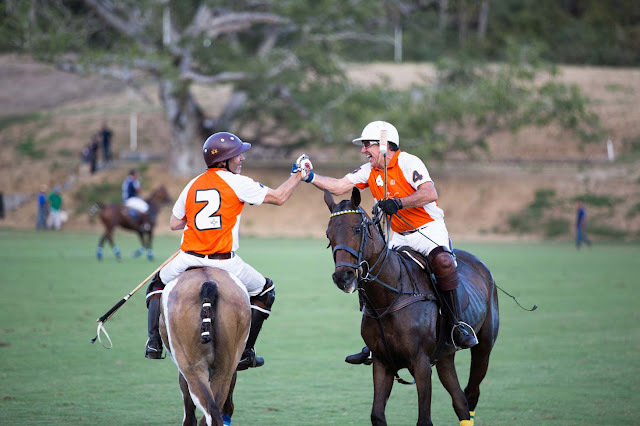 The ambiance is one of training and competition; the club is affiliated with and endorsed by the Mexican Polo Federation. San Pancho is in the municipality of Bahía de Banderas tucked between the coastal villages of Sayulita and Lo de Marcos, and is part of the Riviera Nayarit tourism corridor. It’s about 45 minutes from Nuevo Vallarta, an hour and a half from the city of Tepic, and just three and a half hours from Guadalajara.